As I have moved from one digital task management tool to another over the years, one habit has stuck with me consistently. That is the use of pen and paper in conjunction with my current app of choice. No matter what piece of software is saving, archiving, and (in modern times) syncing my projects, my day to day tasks have been scratched out on paper. Why? 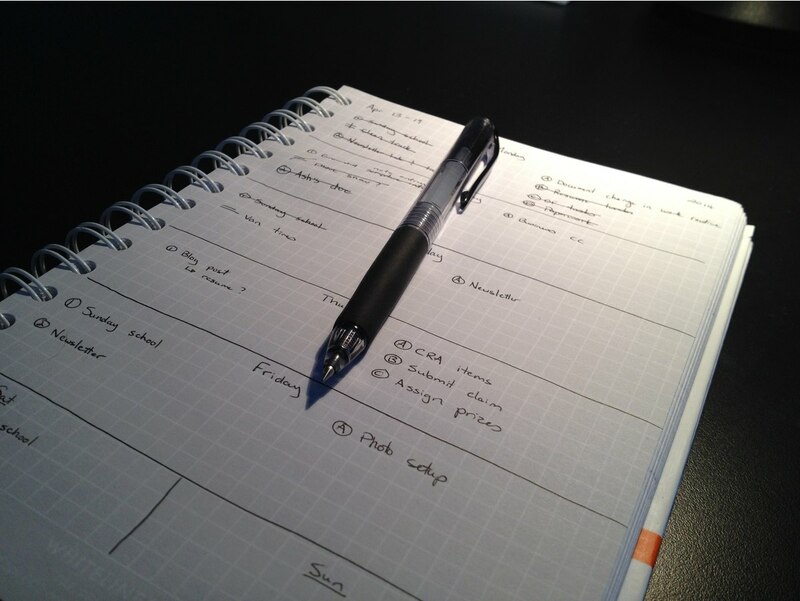 If the tasks are captured in my digital tool, why repeat myself on paper? Why take the time, a longer amount of it as I type much faster than write by hand, to copy them down on a dead tree? Simply put, because I like it. A large reason I've kept up this practice is because I appreciate the time it requires. Especially the way I keep this habit. It's a sort of weekly review. For me, the key is to take 30 minutes on Sunday afternoon or evening and plan my week. I start with a new page in my notebook and draw the days of the week out vertically (Saturday and Sunday share the last row). Then I start to review; first my calendar, then the page from last week, then OmniFocus. For each day, I find two or three big rocks (Most Important Tasks) and write them on the left with a number beside it. Then, I add a couple of less intensive tasks, administrative type things, to the right. Each of those has a letter next to it. This is my prioritization, but also gives me things to do in all moods and energy levels. There are never more than 3 MITs for a day (usually no more than 2 these days) because more will simply result in frustration as I know they will not be completed. Now, I realize this could all be done in OmniFocus. I could tinker with perspectives and get a view that is very similar. But I cherish the exercise and taking the time causes me to closely consider each task and whether it's a good use of my time. Sometimes the slow way is the better way. Another benefit is that every task considered and captured in the moment is not necessarily a good idea. Ideas will come, but not all are ones I want to act on. Some are triggered by caffeine, some from outside influences. Not all are worth my time and energy. At the end of the day, I like to capture all my ideas … but I also greatly enjoy scratching some of with an X on the side. Paper is a good filter in that I take that 30 minutes on Sunday and contemplate each item. It's at my most unplugged time of the week, which means I've been able to walk away from the firehose and remember where my priorities lie. Check Patrick Rhone’s Dash Plus system. I've longed used it, with some modifications of my own. But an X beside an item on your list indicates that the task was not completed, but simply dropped. My tasks should mirror those priorities. Writing with pen and paper is obviously not quite manual labour. The actual physical work and energy burned is probably the same as typing these tasks out. But still, there's something about the act of using your hands with physical objects. I take pleasure in writing with a nice fine tipped pen on a quality piece of paper. On a similar note to the last point, I like notebooks! Finding a new brand of book with the right kind of paper and a nice grid is always a pleasure. And cracking open a new notebook is much more pleasing than starting a list or project in a digital tool like OmniFocus. Each new book is filled with promise. Each new page has so much potential and can take a bad week and make the next that much better. My “system” is truly hybrid. My day to day task management, for a large part, is done on paper. I'm not simply writing out tasks that I plan to work on, I'm also capturing smaller subtasks that arise from the work I'm doing. I love what OmniFocus does for me, but even planning out a larger project, I tend to brainstorm and sketch and get my ideas out on paper. The digital tool keeps me up to date and synced across devices. But it's my manual tools that keep me going.